Credit: 2018 Land Art Generator design competition for Melbourne. Every two years, the Land Art Generator Initiative (LAGI) celebrates the most inspiring designs that integrate renewable-energy production within an urban setting. 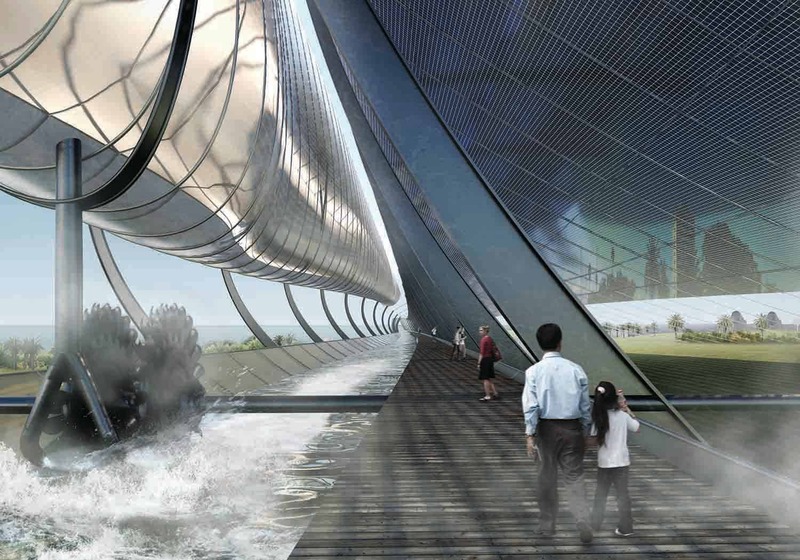 For elegantly blending art and energy generation, Light Up — a project designed for Melbourne, Australia that incorporates solar, wind, and microbial fuel cell technologies to produce 2,220 MWh of clean energy annually — was awarded the first prize. 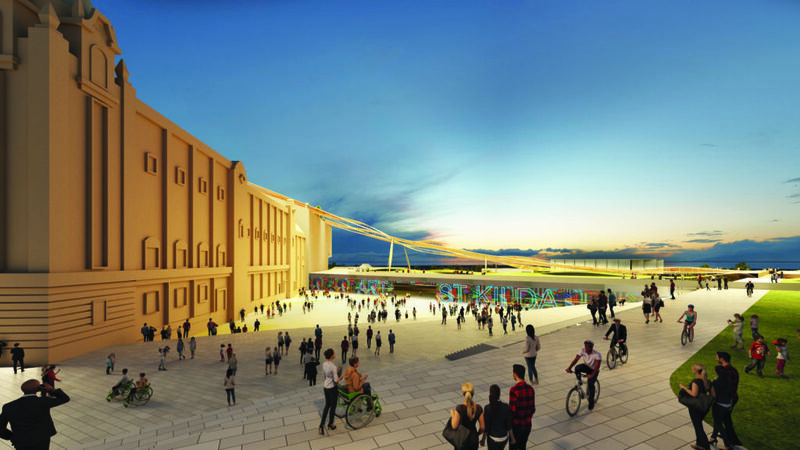 You wouldn’t want to take your family to a picnic near a coal-fired power plant, but who could say no to a stroll down Light Up — NH Architecture’s idea for turning Melbourne’s St. Kilda Triangle, the beachside block home to the historic Palais Theatre, into a power plant and work of art both. The team of architects led by Martin Heide envisions a grand canopy that arches over St. Kilda Triangle, where 8,600 flexible solar panels attached to a lightweight tensile structure would provide 70 percent of the energy output. Energy harvested from the wind that blows across the canopy and microbial fuel cells connected to plant roots would provide the rest. To store all of this energy, the architects propose employing lithium-ion cells sourced from retired electric vehicle batteries. Specifically, 107,000 used EV battery cells from 50 used fully electric cars would be embedded in the handrails of the bridge structures. “The form of a draping tapestry creates a timeless and instantly recognizable image for St Kilda that compliments existing landmarks without competing with them. With such a large component of the artwork spanning Jacka Boulevard, Light Up manages to create one large functional park space that flows from the Palais forecourt to the beach. 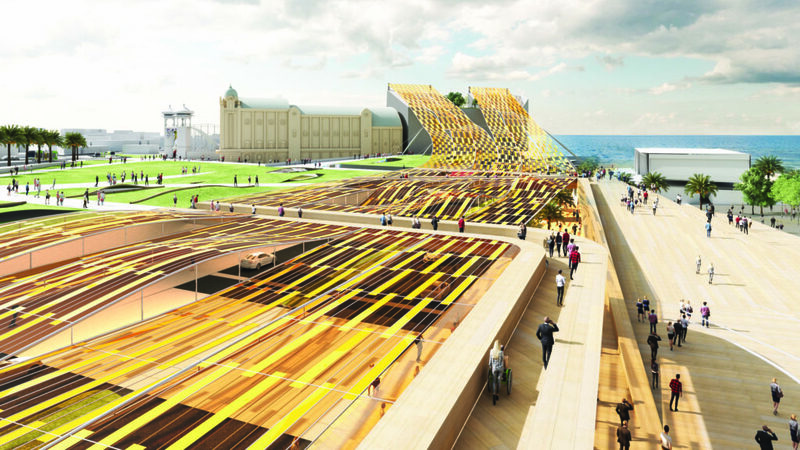 The experience of traversing the park will be like walking through a flowing stream of solar energy,” LAGI co-founders Elizabeth Monoian and Robert Ferry said in a joint statement. Alternatively, St. Kilda could be the seat of an intriguing hydro-solar generator designed by Seattle’s Olson Kundig. The project, called Night&Day, was awarded the second prize for its innovative combination of solar energy and hydro storage to produce 1,000 MWh annually — enough to power roughly 200 Australian homes. 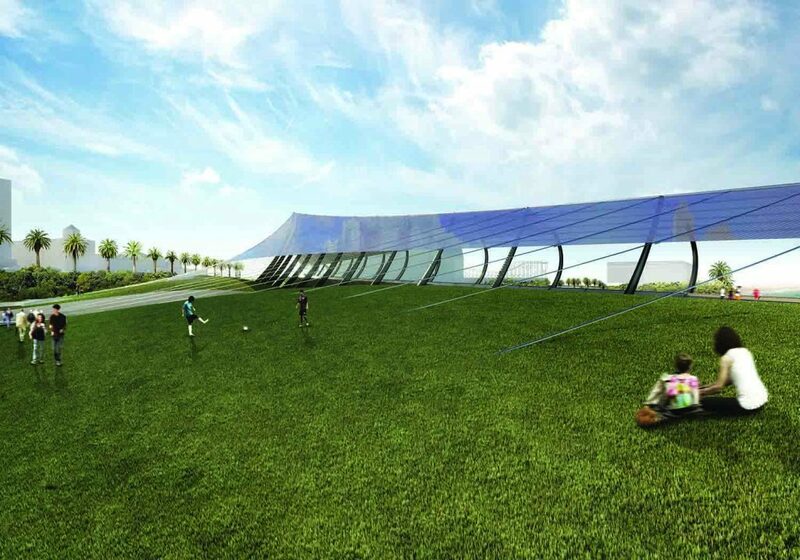 During the day, the site would produce energy from its 5,400 square-meter photovoltaic arrays shaped like a solar sail. Excess energy is used to pump bay water into a suspended hydro battery vessel. At night, gravity does all the work — the potential energy is converted into kinetic energy as the water flows down turbines that generate electricity through a generator. “We’ve long admired Olson Kundig’s work and the range of projects they engage in. Their LAGI 2018 design is profoundly beautiful and perfectly functional, incorporating solar with energy storage—such a critical component of a successful energy transition—in a way that is playful, viscerally engaging, and educational,” said Monoian and Ferry. Light Up’s team will receive $16,000 in prize money, while Day&Night will get $5,000. Another 23 teams were shortlisted. 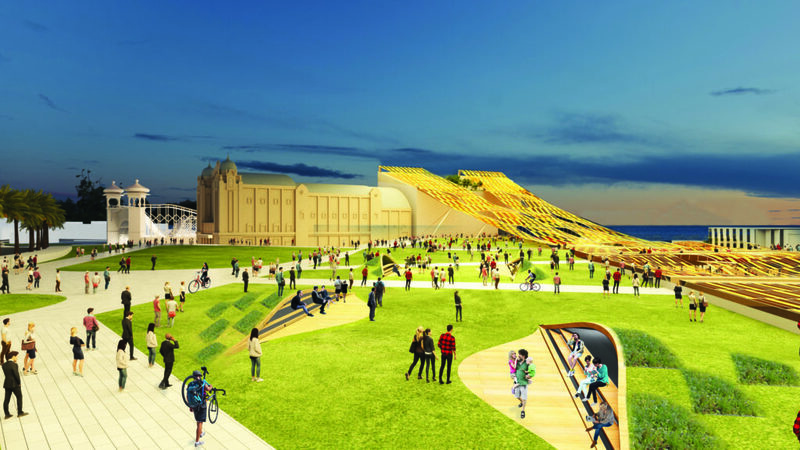 Winning LAGI 2018 does not guarantee that the project will actually be constructed at St. Kilda Triangle, but with enough public support, it could happen. Today also marks the opening of the LAGI 2018 exhibition, which will run for one week at Fed Square Atrium, and the book launch of “Energy Overlays” published by HIRMER Verlag. The book features the top 50 entries to the competition, along with essays about renewable energy.